What makes our skin start to look old? The answer is below the surface. Your skin consists of two basic layers, the dermis (the lower level) and the epidermis (the surface level). The cells of the epidermis renew themselves quite quickly. They are constantly being produced at the bottom of the epidermis and rise to the surface as old cells fall away. The process of a cell being produced at the bottom of the epidermis, rising to the surface and being shed takes around 20 days (maybe a little longer depending on our age). The level we’re concerned with in this article is the lower level, the dermis. This is the level that largely determines how old our skin looks. The dermis has a very slow turnover of cells and cell-replacement slows drastically with age. At 15 years old you still have 50% of the collagen you were born with. At 30 years old you still have 25% of the collagen you were born with. At 45 years old you still have 12.5% of the collagen you were born with. At 60 years old you still have 6.25% of the collagen you were born with. Well (besides its woefully slow replacement schedule) there’s something else that tells the body to replace collagen and elastin. When the skin thinks it has been damaged it goes into wound-repair mode. Microneedling uses several tiny needles to prick the skin, reaching down into the dermis, and stimulating the production of precious collagen and elastin. New collagen and elastin hold the epidermis to the dermis more tightly smoothing out wrinkles and fine lines. The skin is lifted and (literally) rejuvenated. This method is also used to greatly improve the appearance of scars and stretch marks as well as reduce the size of pores. Microneedling safely reaches the dermis and triggers a completely natural reaction – something lasers and creams can’t do. Which form of microneedling is best? Up until recently Dermaroller was the best method of microneedling. It does, however, have one or two drawbacks. The first drawback is that, because the needles are rolled over the skin on a drum, they enter at one angle and leave at another. This causes more damage to the epidermis than is necessary. The second drawback is that different areas of the face require different needle lengths and each roller only has needles of a certain length. Dermapen eliminates both of these problems. Firstly the needles aren’t rolled, they’re delivered vertically in and out of the skin thus reaching the dermis and triggering the wound-response with minimal damage to the epidermis. 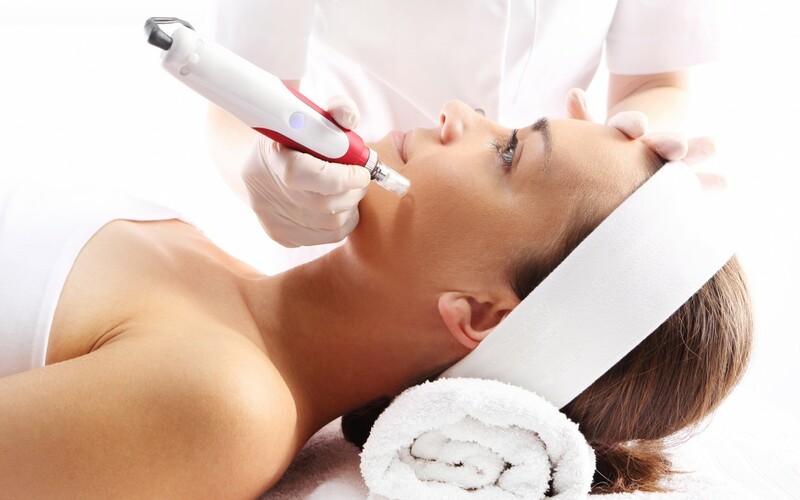 Secondly the needle depths on the Dermapen are fully adjustable which means the whole face can be done in one session, choosing exactly the right depth for each area and with no extra charges. There is less pain with the Dermapen and this can be minimised further with the use of an anaesthetic cream. Most agree that it’s a relatively comfortable process. So there we have it, microneedling is the natural way to trick your body into producing fresh, new collagen and elastin. And Dermapen is the sate of the art in microneedling. I must add a big thank you to our friend Gaynor Richards at CosMediSpa on the Gold Coast, Australia. Gaynor brought Dermapen to our attention and told us she was getting exceptional results with her clients, consequently we’re the first clinic in Barnsley to offer the treatment.